Lightning Process Builder will soon become GA once the Spring’15 rollout completes in early February, just a few short weeks away as i write this. I don’t actually know where to start in terms of how huge and significant this new platform feature is! In my recent blog Salesforce evolves customization to a new level! over on the FinancialForce blog, i describe Salesforce as ‘the most powerful and productive cloud platform on the planet’. The more and more i get into Process Builder and how as a developer i can empower users of it, that statement is already starting to sound like an understatement! There are many things getting me excited (as usual) about Salesforce these days, in addition to Process Builder and Invocable Actions (more on this later), its the Internet of Things. I just love the notion of inspecting and controlling devices no matter where i am on the planet. If you’ve been following my blog from earlier this year, you’ll hopefully have seen my exploits with the LittleBits cloud enabled devices and the Salesforce LittleBits Connector. I have just spent a very enjoyable Saturday morning in my Spring’15 Preview org with a special build of the LittleBits Connector. That leverages the ability for Process Builder to callout to specially annotated Apex code that in turn calls out to the LittleBits Cloud API. The result, a fully declarative way to connect to LittleBits devices from Process Builder! If you watch the demo from my past blog you’ll see my Opportunity Probability Pointer in action, the following implements the same process but using only Process Builder! Once Spring’15 has completely rolled out i’ll release an update to the Salesforce LittleBits Connector managed package that supports Process Builder, so you can try the above out. In the meantime if have a Spring’15 Preview Org you can deploy direct from GitHub and try it out now! UPDATE August 2015: It seems Process Builder still has some open issues binding Percent fields to Actions. 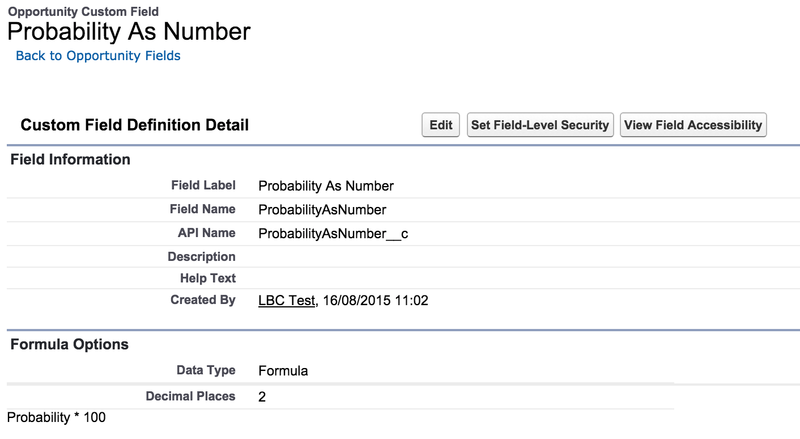 Salesforce have documented a workaround to this via a formula field. Thus if you have Percent field, please create Formula field as follows and bind that to the Percent variable in Process Builder or Flow. How can developers enhance Process Builder? There are some excellent out of the box actions from which Process Builder or Flow Designer users can choose from, as i have covered in past blogs. What is really exciting is how developers can effectively extend these actions. So while Salesforce has yet to provide a declarative means to make Web API callouts without code. A developer needs to provide a bit of Apex code to make the above work. Salesforce have made it insanely easy to expose code to tools like Process Builder and also Visual Flow. Such tools dynamically inspects Apex code in the org (including that from AppExchange packages) and renders a user interface for the Process Builder user to provide the necessary inputs (and map outputs if defined). All the developer has to do is use some Apex annotations. 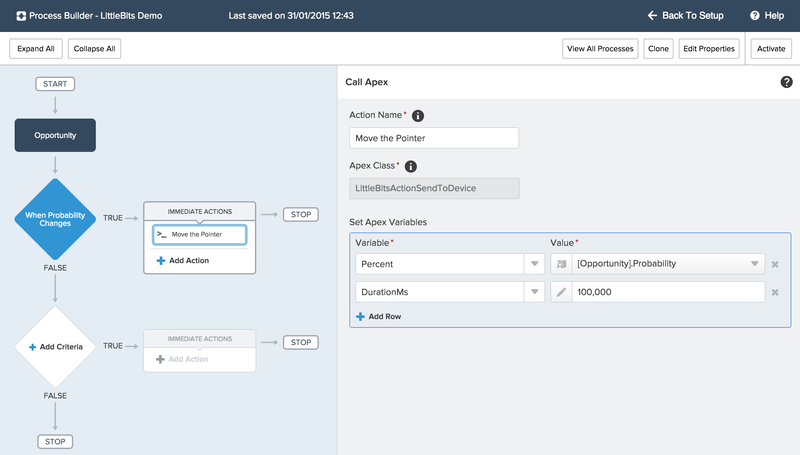 I learn’t quite a lot about writing Invocable Actions today and will be following up with some guidelines and thoughts on how i have integrated them with Apex Enterprise Patterns Service Layer. Categories: Apex, Flow, Iot, LittleBits, Process Builder, Tools | Permalink. Keep the awesome posts coming! Reading what you’ve done with the platform, especially the process builder, has excited me even more about it and other upcoming features. I know, if the sun wasn’t shining (rare in the UK at this time of year), i would be sat here all day exploring this stuff! My mind is a buzz with the possibilities of custom actions one can expose to Process Builder and Flow Designer.